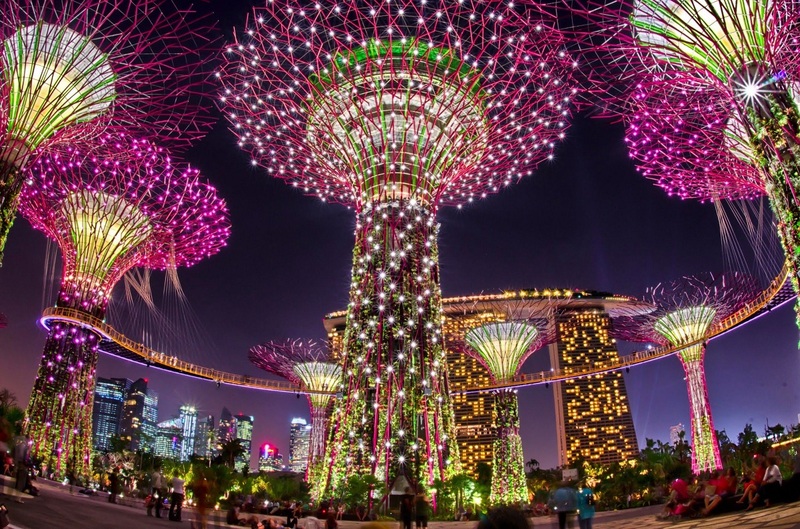 Whizzing around Singapore is all about exploring the world’s best skyscrapers, luxury buildings, ample spaces of nature and wildlife. With all its exotic elements, the city has plenty to keep you busy throughout your vacation and you never stop finding for more and more. To ensure a successful, safe and memorable trip to Singapore, there are few things that you need to know. Indoor Playgrounds – kids will just love it. Sunflower Garden – rooftop garden housing hundreds of sunflowers – purely breath-taking. Butterfly Garden – enjoy the sights of myriad types of butterflies. Entertainment Deck – snag yourself a seat and enjoy music and gaming. Cactus Garden – houses cacti, arid plants, and a café. You can enjoy a drink or two as you relax and bask in the sun. Orchid Garden and Koi Pond – abundant with flowers, the place is quite healing and soothing in the buzz of the area. Flight delays are wished for at this airport. Read why. Nowhere else you can see such thriving art forms but only here. 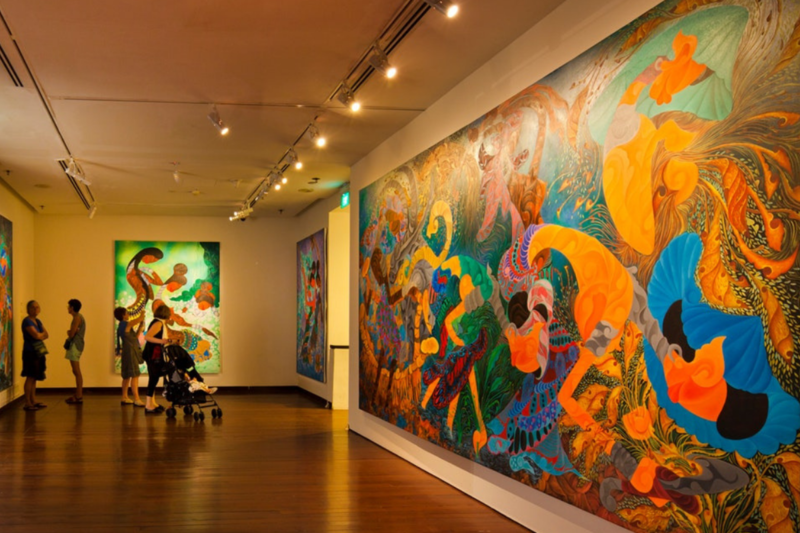 Singapore Art Museum is the best opportunity to unwind the best of Southeast Asian contemporary art. If you are that person who’d love to spend hours and hours gazing at art then surely you need to spare more-than-a-few hours to explore the whole place. Because each art form tangles your heart tight and surely you will be lost in it. Every Friday, from 6 pm to 9 pm, the Singapore Art Museum opens its doors without any charge to all art lovers and tourists. So don’t miss it. 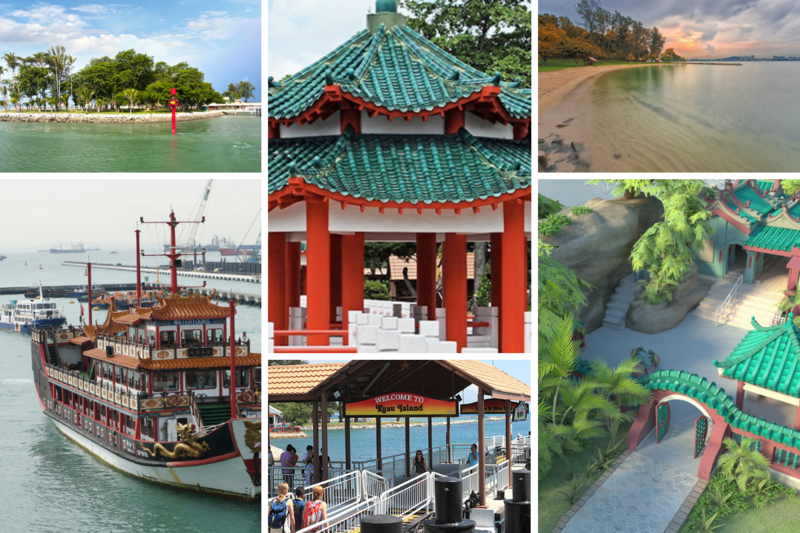 If you are looking for an off-beaten track with a good grasp of nature then Kusu Island checks all your boxes. Kusu Island, located 5.6 km south-west of Singapore, is just about 40 minutes away from the city. To get to the island you need to take a ferry from Marina South Pier. You can buy your tickets from Singapore Island Cruise – main entrance of the pier. Carry food and lots of drinking water with you as you can’t find a single shop on the island. It’s just a day trip – camping and overnight stays are prohibited. So plan accordingly. The island houses a lot of activities so wear comfortable clothes and shoes. Also, keep in mind about the ‘Heat’. Snorkel to spot the sea turtles and other marine fauna. Visit the sacred sites – Da Bo Gong Temple and the three Malay kramats. Don’t forget to make a wish. There is a belief that your wish comes true when you make a wish at this place. Relax by the shore and enjoy the beach views. Escape the heat by going for a long swim in Kusu Lagoons. Gardens by the Bay is a huge, colorful garden destination with a myriad of flora and garden artistry. There’s so much to cover at this place! From huge manmade “Supertrees” to the world’s largest glass greenhouse (Flower Dome) everything is spectacular and overwhelming. Flower Dome – the world’s biggest air-conditioned greenhouse is a palette of extraordinary flowers. 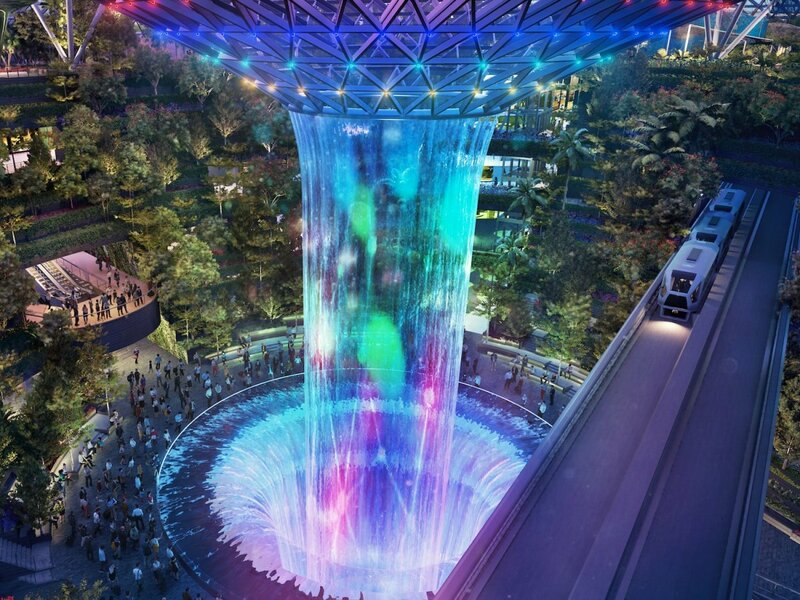 You can also see the world’s tallest indoor waterfall in here. 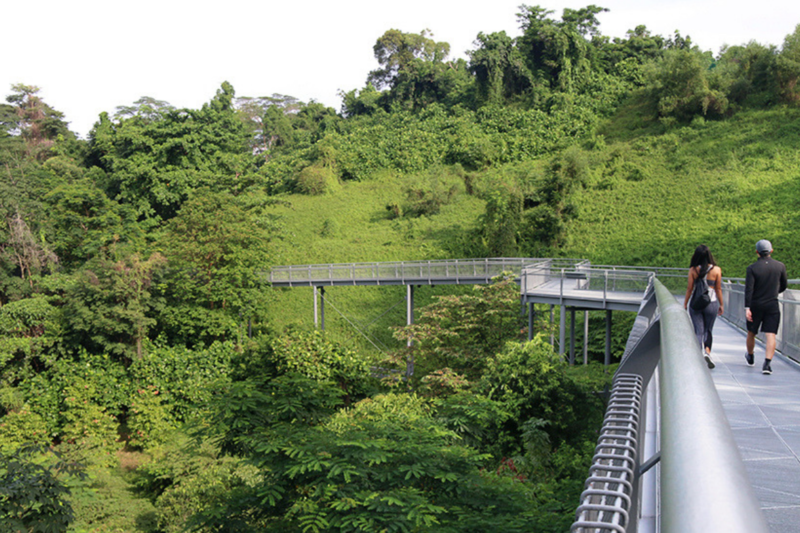 OCBC Skyway – an elevated skywalk connecting some of the Super-trees. Experience a thrilling walk along the OCBC Skyway which is 22 meters above the ground. Sun Pavilion – houses one of the largest cacti and succulent collections in South-east Asia. Children’s garden – If you have kids under an age 12 then you have to visit this one-hectare play area –surely your kids deserve this place. Lights-music show at Gardens by the Bay. The first show begins at 7.45 pm and the second show at 8.45 pm. This light show is totally free. Make sure to arrive 10-15 minutes earlier to grab a good spot and treat yourself with a flashy and astounding show of lights and music. 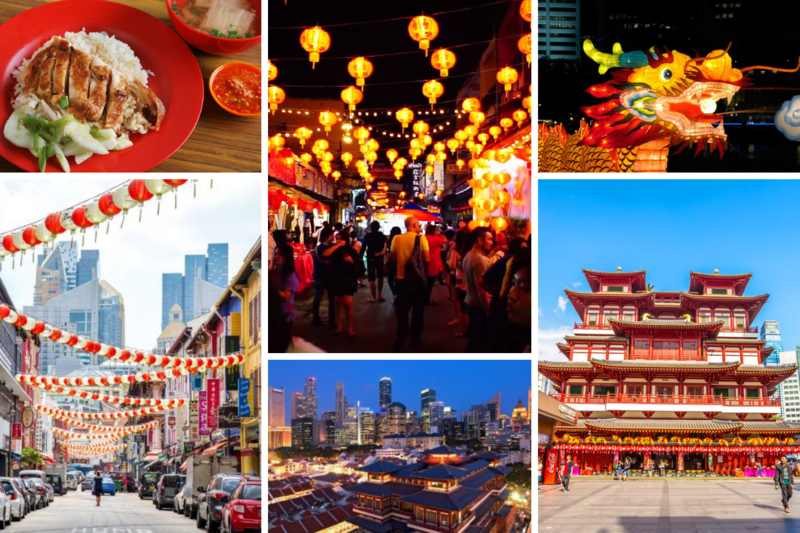 To hunt for the cultural treasures of Singapore, you’ve got nowhere better than China Town. There are plenty of things that you can discover – all within walking distances from each other. 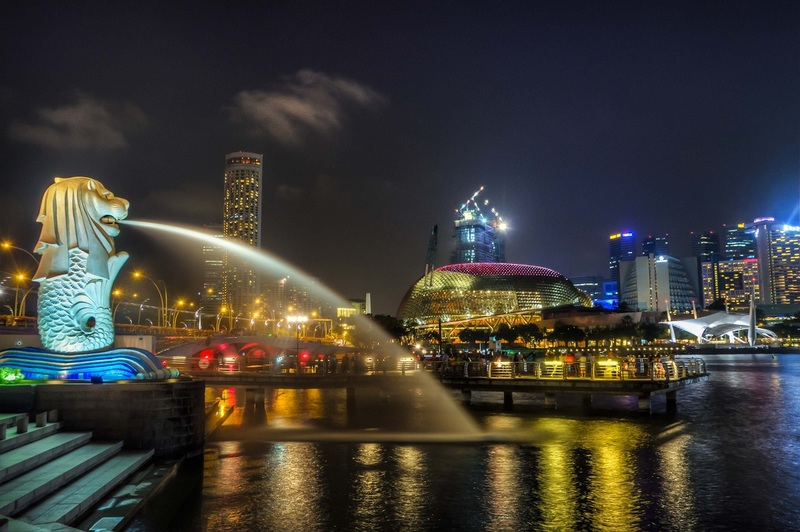 City’s oldest and thriving neighborhoods, Singapore’s cultural spots, local food restaurants, and other street stalls – you’ve got a plethora of options for eating and entertainment here. Thian Hock Keng Temple – Explore the rich Chinese architectural excellencies clearly elevated by the temple’s design. Chinatown Food Street – Eat like a local. Must-try dishes – Kaya butter toast, Roti prata, Hainanese chicken rice, and Nasi lemak. Buddha Tooth Relic Temple & Museum – Learn the Buddhist culture, art, and history – you will be lost in a total spiritual and aesthetic sense. Chinatown Heritage Centre – Discover the chronicles of the lives and times of early Chinatown. Bodylite – After a long day of your walk you need to soothe yourself out for the next day. So, get to Bodylite, enjoy the spa treatments and feel rejuvenated after. Go on a hike in the great outdoors and escape to the urban jungle at the Southern Ridges. It is a 10km long trail connecting a series of hill parks in the southern tip of Singapore. This trail has a plenty to offer to the hikers – Mount Faber Park, Telok Blangah Hill Park, HortPark, Kent Ridge Park and Labrador Nature Reserve. Need not worry about the distances – various entry points of the southern ridge allows you to customize your travel distance according to your willingness to trek or walk. Throughout your journey, fantastic aerial views of the city are guaranteed. Arab Street is Singapore’s historic Muslim quarter. Wherever you go within the quarters – brightly colored fabrics, Persian jewelry stalls, traditional Arabic restaurants, and impressive street arts follow you. If you want to take some souvenirs home sure you can count on this place. What All You Get To Do? Blujaz Café – Quench your thirst with a delicious cup of true Arab Coffee. Maison Ikkoku – Feast on a slice of rainbow cake. Simply amazing! Magic Carpet – best for Beirut-Style cuisine. Prefer dinners to lunches at this place. Café Le Caire – offers authentic Egyptian and Middle Eastern food – hummus, babaganoush, tahini, raita, and more. Sifr aromatics – design your own scent from natural oils and bring it home. 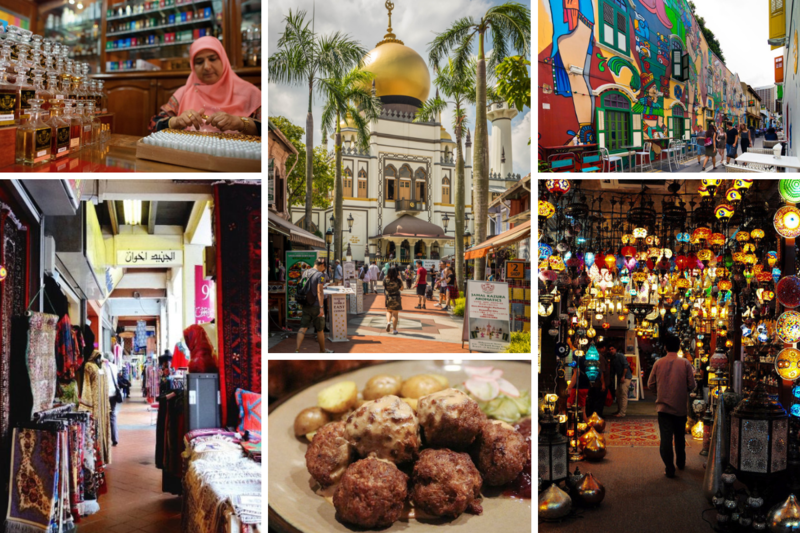 Arab Street and Haji Lane – Check out the densely-stocked basketry and handicraft shops. Haji Lane is considered the bohemian shopping strip, offering unique clothing. Majid Sultan – magnificently grand mosque with golden domes and wide prayer halls. It is located in the center of the Arab quarter. Malay Heritage Centre – provides wonderful cultural exposure and learning opportunities for visitors. Malay Art Gallery – love for Keris? Then you need to visit this place to get a peek into their old and authentic collection. Arab Street is walking distance from the nearby Bugis MRT Station. So wherever you are, set your journey to the Bugis MRT Station from where Arab Quarters is just a matter of a few more steps. 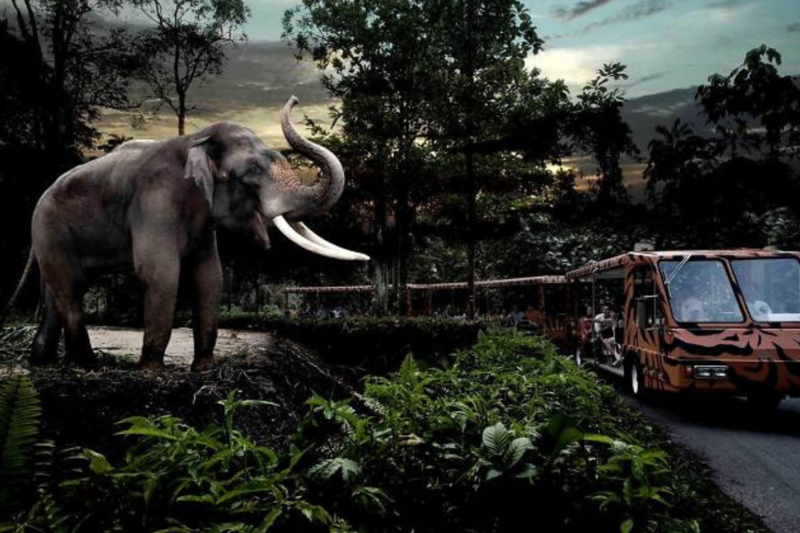 The Night Safari or the Night Zoo set in a lush rainforest is a unique concept that shows wildlife in their natural habitat at night. Take a trip around the park via tram cars, get a glimpse of the nocturnal animals, and watch the safari’s shows – featuring amazing animal talent. Night Safari is extremely crowded and seriously there is no way you can escape the crowds. So be prepared for this and wear comfortable clothes to manage a few inconveniences. If you are comfortable with walking, you have a chance to escape a little of the crowds. There are 4 trails you can go on, namely the Fishing Cat Trail, the East Coast Lodge Trail, Leopard Trail and the new Wallaby Trail. The park’s entrance is lined up with a chain of food stalls. Don’t miss the Indian buffet that starts at 8.30pm. Smoking within the park is strictly prohibited. Didn’t follow the rules? Then you are subjected to pay heavy fines. Capella Singapore – Located on the Sentosa Island and surrounded by 30 acres of lush lawns, roaming peacocks and just steps away from a family-friendly beach. Marina Bay Sands – World’s largest rooftop infinity pool + stunning views of the city skyline + luxury accommodation. The St. Regis Singapore – Superbly located at the prime shopping district of Orchard, featuring a full-service spa, an outdoor pool, and a 24-hour fitness center. 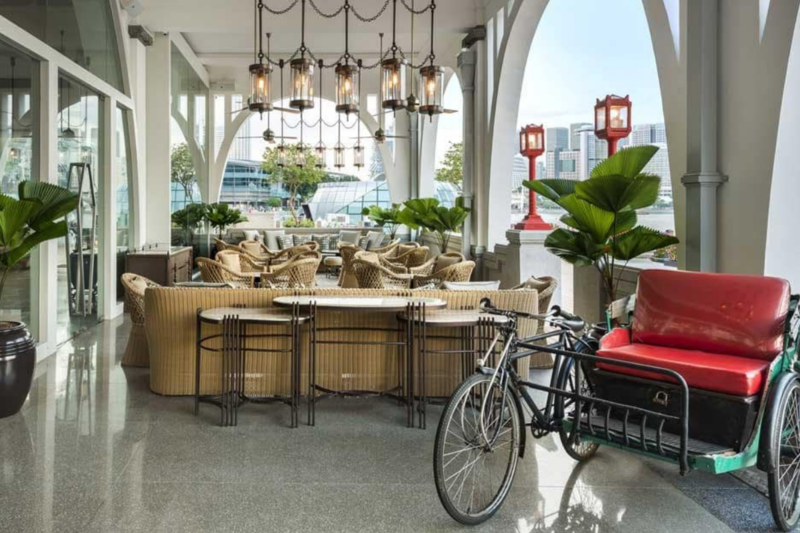 Mandarin Oriental, Singapore – In a harbor-front setting, the sophisticated hotel is located overlooking Marina Bay, It has got the most luxurious spa facilities and gardens to relax in. Sofitel Singapore Sentosa Resort & Spa – located well within a short distance from Palawan Beach, Universal Studios Singapore, and world-renowned golf course. Moon – Just at the shopping malls of Bugis Street – the place although an inexpensive yet a stylish lodging option. Dorsett Singapore – Ideally located in the heart of Chinatown with rooms much larger than in any other boutique hotel. 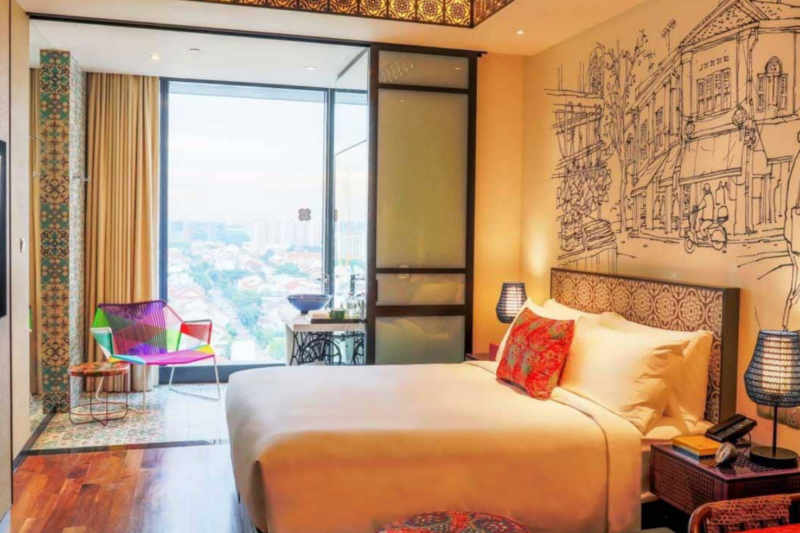 Hotel Vagabond – a boutique hotel located near historic streets –Little India and Arab streets, well bathed in Parisian-inspired and luxuriate art forms everywhere. Holiday Inn Express Singapore Clarke Quay – a modern, reasonably priced upper-middle-range hotel with extensive skyline views located on the edge of Chinatown. When to Go to Singapore? No matter when you go – the city has a warm and humid climate throughout the year. The weather is fairly consistent and predictable year round. So, visiting Singapore at any time of the year does not make much difference. However, you may want to avoid going between May and June when the heat is at its peak. And there you have it! The most important boxes filled with all the information you need to travel Singapore. This was meant to be a quick post but it’s turned into a rather ‘wordy’ one instead. Sorry! It’s your turn though – you’ve got anything to tell us? Use the comment section below. Nice Blog. As,i would like to visit Singapore Night Safari very soon and i must say your information would help me. Hey Tania, we would love to hear your experience in Singapore. Write to us and we promise to take your experience to others.